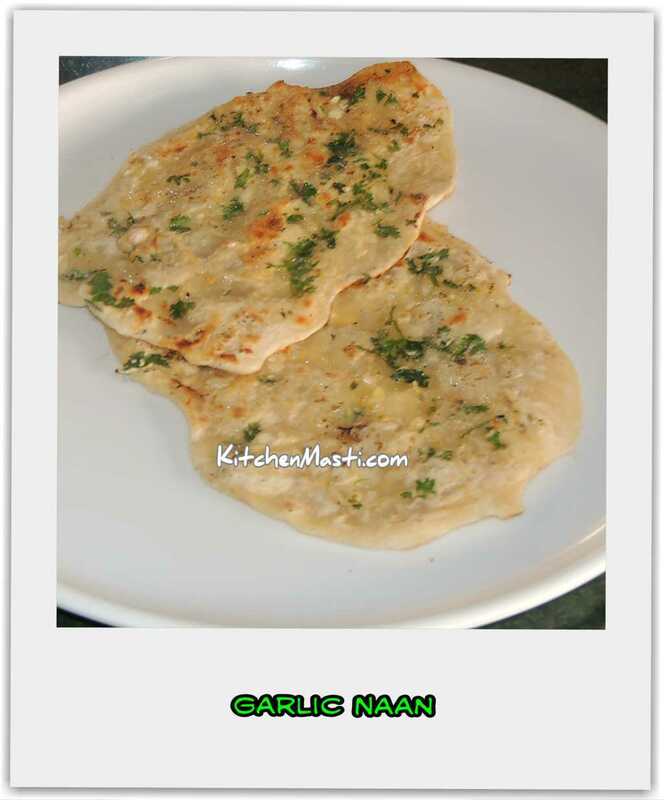 Garlic Naan, is one of the famous North Indian dishes. I am sure all the north Indian food lovers will love this dish. Any spicy side dish like veg kolhapuri, Kadai paneer, palaak paneer will be a good combination with this. 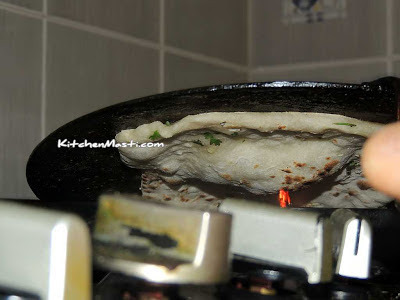 Basically it is prepared just like Naan , and the only difference is that some spicy masalas are added to it.. Usually it is cooked in a tandoor but in case if you do not have it , there is absolutely no reason to worry. You can cook it in gas tandoors or electric tan doors which have now flooded the market. 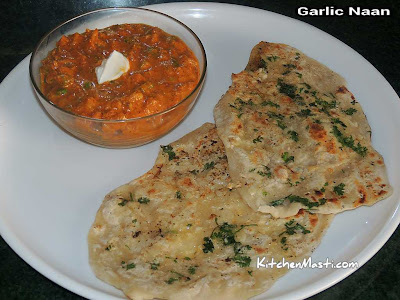 If you do not have even these, you can even cook it in the ordinary tawa ( pan ) on the gas stove. Now let me tell you in detail, the process of cooking garlic naan. This dish takes about ten minutes to knead the dough. 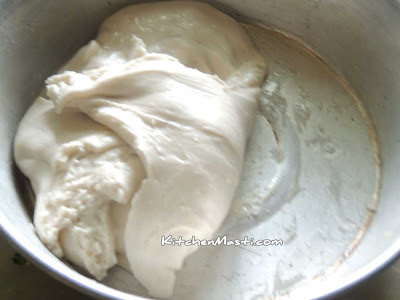 After you knead the dough, keep it aside for around five to six hours. In the mean time, mix yeast in warm milk. Now, take the sieved flour in a mixing bowl. Add the yeast with the milk mixture along with curd and sugar. Mix all the ingredients along with butter. Knead the dough, if necessary, you can add some more water. Now, close the bowl with the lid and leave it aside for around five to six hours. 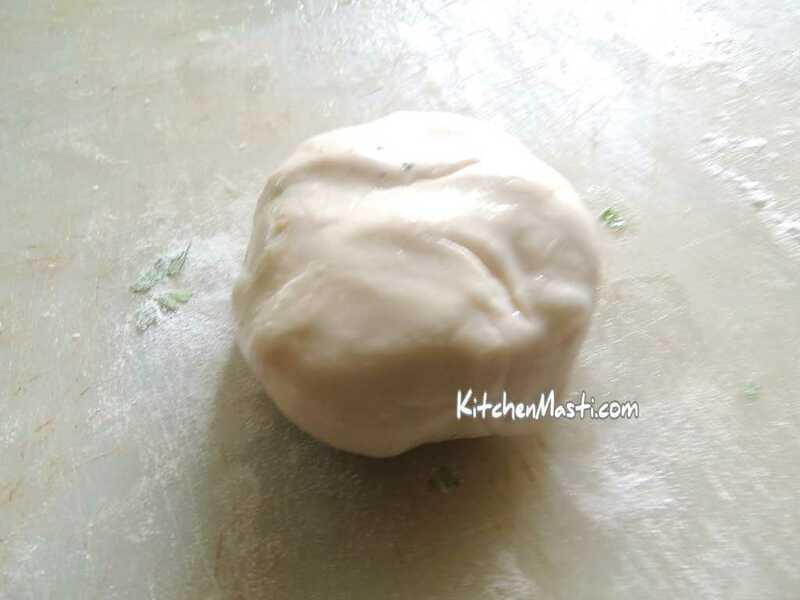 After six hours, roll out even sized balls from the maida dough. Now, dust one maida ball with a little maida flour. Roll it in to a small flat circle. 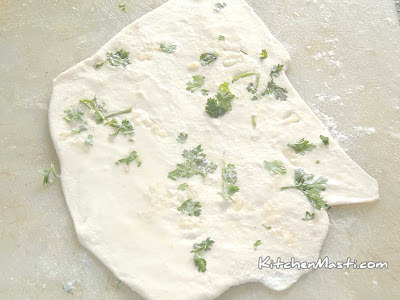 Place small evenly sized garlic pieces and chopped coriander leaves over the small circles. Dust some more maida flour over the naan. Now, roll it into little more bigger circles. Pull one end of the circle to make it elongated like I have shown it in the below image. Apply water on top of the one side elongated naan. Now, heat a pan for a few moments. Place it on the hot pan in such a manner that the water applied part sticks to the pan. Cook the other side of the naan on direct flame till brown spots appear on the naan. Remove the garlic naan from the pan and transfer it onto a plate. Serve hot with butter applied on top of it. Never use dosa pan or non stick pan for this. Use an iron or aluminium pan with a handle. The pan should not be too deep.